We’re not referring to Panthera tigris, the largest cat species, but instead the invasive Aedes albopictus, the Asian tiger mosquito. It shares a name with the big cat because of its striped appearance, and for its small size, it’s probably every bit as fierce and potentially dangerous. Asian tigers have spread very rapidly across the U. S. since being detected in the 1980’s, probably imported through the Port of Houston where they had bred in rainwater in used tires imported from Southeast Asia. They currently are very prevalent in the Southeast along with many other areas of the country. 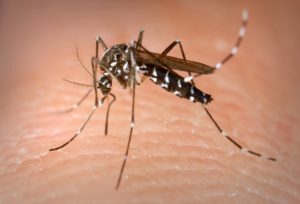 They and other Aedes species can be especially annoying because they bite during the daylight hours in contrast with other local mosquitoes that bite nearer dusk and dawn and at night. We’re writing this article because of our concern about the increase in the spraying of yards and other large areas with broad-spectrum insecticides to try to get rid of adult mosquitoes, including the invasive Asian Tiger. Daytime spraying of insecticides on this scale will harm anything else flying at the time of the spraying including bees, pollinators, and many other insects that are vital to the complex food web on which birds and other wildlife depend. Even if spraying is done at nighttime when bees are not flying, this is when most of our moths are flying, as well as katydids, leaf hoppers, stick insects, and many beetles. And according to the NC Department of Public Health, nighttime spraying is ineffective against the Asian tiger mosquito and our other local Aedes species. If the insecticide is applied as a contact poison to the leaves of plants, it also harms any other insects contacting that plant. 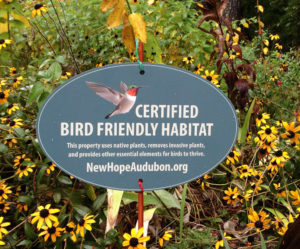 Because of our concerns about disrupting the local ecology, New Hope Audubon’s criteria for Bird Friendly Habitat Certification at the Silver and Gold level requires minimizing insecticide use outdoors and, at the Platinum level, eliminating insecticide use altogether. Fear of disease spread by mosquitoes (arboviruses) and the nuisance of mosquito bites, the latter made worse by the daytime biting Aedes species, are probably the two biggest factors leading to an increase in spraying. Two diseases have raised the greatest fear, Zika and West Nile. The Asian Tiger and another invasive Aedes species, Aedes aegypti, the Yellow fever mosquito, are potential carriers of these two diseases along with well over 20 other serious arboviruses. Fortunately, the Yellow fever mosquito is not common in this state. The other local, disease-carrying mosquitoes are associated with many fewer arboviruses. The Eastern Tree Hole mosquito can carry La Crosse Encephalitis, but this is very rare disease. The Southern and Northern house mosquitos can carry West Nile, and the Black tailed mosquito is a potential carrier of Eastern Equine Encephalitis, which again is rare. What is the current threat from Zika and West Nile in this area? Regarding Zika, the CDC reports that the arboviruses potentially carried by the Asian Tiger and Yellow Fever Mosquito do not “continuously circulate in the continental United States.” Instead a local outbreak would have to be caused by travelers from outside the country carrying these diseases and returning or visiting areas of the U. S. that have populations of Yellow fever mosquitoes or Asian tiger mosquitoes, which then could spread them in that local area if just the right conditions prevail. According to the NC Department of Public Health, there have been zero “locally acquired Zika virus disease cases reported” in 2016, 2017, and the early part of 2018, even though there have been some travelers returning to NC with the disease. Regarding West Nile, which does circulate in the U. S., the CDC reports only 1 confirmed case in North Carolina in 2018 as of July 24, 2018. In fact, there is universal agreement in the sources we’ve listed at the end of this article that the first line of defense against mosquitoes is elimination or treatment of egg-laying sites to prevent them from reproducing. This is something you can do in your own yard at little or no cost. Eliminating egg laying sites for the Aedes species involves eliminating sources of stagnant water around your and your neighbor’s yards in any type of possible pocket breeding sites since they are “container breeders”. They lay their eggs on the sides of anything that has or can hold water, and the eggs can lie dormant for months until rain or other water sources provide the needed water for hatching. Here are some things to do. 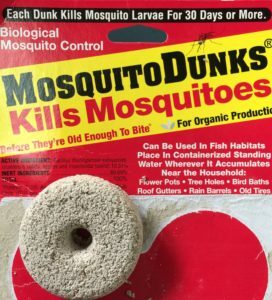 Stagnant water that cannot be eliminated by other means can be treated periodically with a larvicide named BTi (Bacillus thuringiensis israelensis), which is sold as “mosquito dunks’ in garden and hardware stores. BTi effectively targets mosquito larva without harming other insects. Eliminating or treating egg-laying sites will apply to all mosquitoes. The Culex species, which can carry West Nile, lay eggs in storm sewer catch basins, larger pools of water, and ditches. So, if there’s evidence you’re being bitten by those mosquitoes and concern in your area about West Nile, you will have to deal with these breeding grounds. Swimming pools are not a problem as long as they are kept properly chlorinated and filtered. Since mosquitoes spread out from their hatching sites (up to 200 yards for the Asian Tiger), dealing with egg-laying sites demands a neighborhood-wide approach. Treating just your yard means you will still share your neighbors’ mosquitoes. Another approach is barrier protection to keep mosquitoes from biting. This can involve screening, use of protective clothing, or repellents. 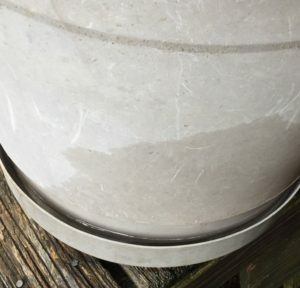 If you, like Jim, have noticed over the last 10 years or so that you are getting bitten by mosquitoes much more often during the day than you remember from the past, you most likely are being plagued by the invasion of the Asian Tigers. 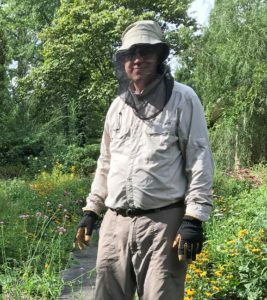 Preferring not to cover himself in repellents like Deet, Jim sometimes needs to garb himself in a long sleeve shirt, long pants, and a head net to work comfortably in his garden in the daytime in the summer. (He hasn’t been able to get his nearby neighbors on-board yet to eliminate breeding sites in their yards.) If you want to go the route of using repellants, Consumer Reports’ latest ratings of repellants in August of 2018 showed that Deet, Oil of Lemon Eucalyptus, and Picaridin were effective against mosquitoes. Screened-in porches also work well for enjoying the outdoors in summer. Mosquito traps that lure mosquitoes and then trap them are a possibility for control of adult mosquitoes, but they should be a second line of defense, not a substitute for first eliminating breeding sites. There is much false advertising for such devices, so buyer beware. See the sources at the end of the article for a fuller discussion of traps and note that different attractants are needed for different mosquitoes. How about bug zappers since they are enjoying somewhat of a resurgence based on concerns about mosquitoes? Simply put, they do not kill mosquitoes. Mosquitoes are not attracted to the UV light used by bug zappers. Instead the zappers kill a wide variety of non-harmful insects and thus harm the ecosystem. With a combination of eliminating egg laying sites, treating ones that cannot be eliminated, and perhaps using traps, you should be able to reduce substantially the numbers of the mosquitoes breeding in your yard. You can also use barrier protection to keep from being bitten. 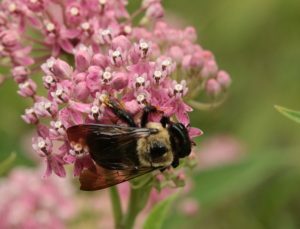 By forgoing spraying of insecticides, you will be helping pollinators and the other insects that are a vital part of the ecosystem. As mentioned before, if you live in a typical urban or suburban setting, any control program must involve others in your neighborhood, so educating your neighbors may be a vital first step. Maybe you can even involve the neighborhood youth by making a game out of finding “container” breeding sites through the neighborhood as you teach them about those invading Asian Tigers and the other local mosquitoes.